Gravity isn't uniform. Denser planets and objects in space — that is, things with more mass to them — experience a stronger pull of gravity. But even if you zoom in to the level of a single planet (or, in this case, our Moon), gravity isn't uniform all the way around. That's because the mass of the Moon isn't uniform, either. It varies, along with the topography. 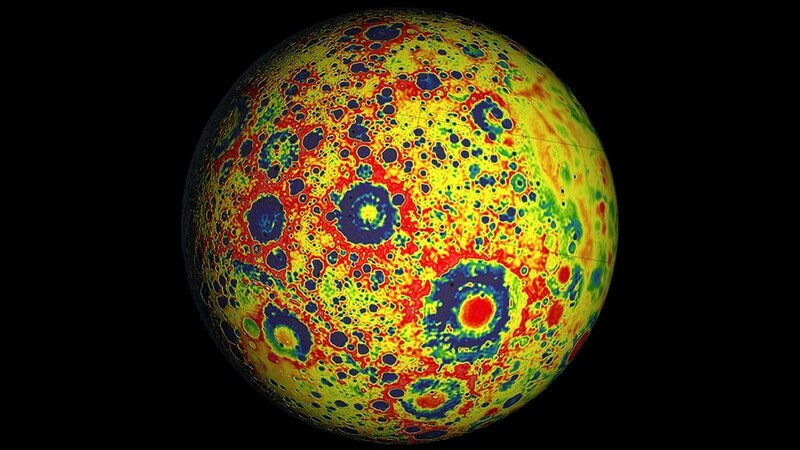 In some places, the Moon's crust is thicker. Those places have more mass, and thus, more gravitational pull. This map, showing changes in density and gravity across the surface of the Moon, was made from data collected by Ebb and Flow — a matched set of NASA probes that mapped the Moon's gravitational field before being intentionally crashed on its surface last December. By measuring the gravitational field, these probes told us a lot about how the density of the Moon varies which, in turn, tells us a lot about topography. You can read more about the probes (and see some videos they took of the lunar surface) at the NASA Visualization Explorer.